One little gadget has helped me in unforseeable ways. 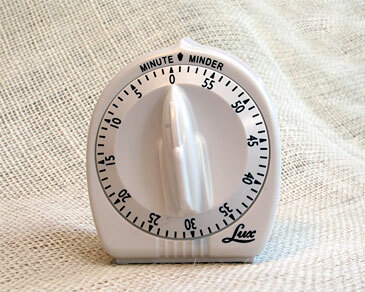 Yeah, it’s a cheap-o dollar store kitchen timer. I have just been truly amazed at how much more I have been getting done and how much lower my stress level has been the past couple of months since I put my little timer to work. At first I thought it may add to my stress (knowing it is ticking away somewhere in the background timing me while I do some of my favourite time-wasting/enjoyable things I like to do). But the truth is I have found the opposite to be true! I could (and have) easily spent WAY too much time on that thing. But I love it! I haven’t removed any fun & enjoyable things from my life (and have no interest in that). I just wanted to free up more time to enjoy as many other of my interests as I could each day. And I have! And it cost me a buck. The best investment I have ever made. If you are like me and could use a little help better distributing your time you might just enjoy having a timer as much as I do. July 6, 2010 in counteracting stress hormones, discipline, facebook, happiness, hobbies, love, multitasking, personal satisfaction, pride, stress. ← It’s official! All classes with me are a go ALL summer long!